We know that man’s one true love is food and always has been. We have a number of food delivery apps to keep connected in this fast-paced world. 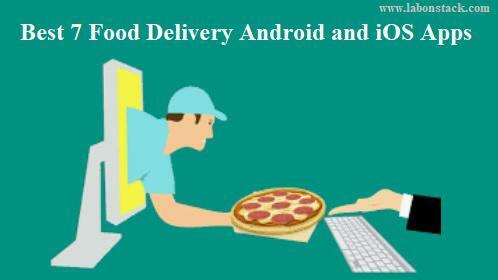 As per popularity among users, here’s a list of top 7 food delivery Android and iOS Apps in India that you can download on your smartphones to order food from. Now we see the food delivery and restaurant segment is now thriving at a blistering rate. Such apps have been a major hit among tech-savvy individuals. In this app, you just need to input your location these apps will show you hundreds of restaurants in your area that you can try without ever leaving the couch. We’ve rounded up the best food delivery apps that will bring deliciousness straight to your doorstep. Zomato is a restaurant search and discovery service founded in 2008 by Deepinder Goyal and Pankaj Bhardwaj. Zomato is the best restaurant finder app to search for and discover restaurants to eat out at or order in from. Browse through restaurant menus, photos, user reviews and ratings to decide where you want to eat, and use the map feature to guide you there. It currently operates in 23 countries, including India, Australia, and the United States. It features restaurant information such as scanned menus and photos sourced by local street teams, as well as user reviews and ratings. The company also provides cashless payment, online ordering, white-label apps, table reservation, and point-of-sale systems. Foodpanda is India’s best Food Delivery App. This is the world’s largest Food Delivery app too. They deliver in more than 50 countries worldwide. The company has partnered with over 40,000 restaurants. The service allows users to select from local restaurants and place orders via the mobile application as well as the website. They believe food is a pleasure and food ordering should be fast and definitely a fun experience. Choose from more than 15000 restaurants and a wide range of cuisines like North Indian, South Indian, Mexican, Chinese, Thai, Continental and more. Domino’s pizza delivery app is most popular with pizza lovers across India. It works on Android, Windows Smartphones and iOS. Domino’s pizza delivery app comes with an easy-to-use interface, a quick selection menu, and a smartly designed app-interface that lets you order food online of your choice. The unique feature of Domino’s Pizza delivery app is that it allows users to apply coupons to their orders and also choose the mode of payment as per their convenience. The app provides users with the easiest way to order food without making a call. Swiggy is a Food ordering and Delivery Company based out of Bengaluru, India. Swiggy was inspired by the thought of providing a complete food ordering and delivery solution from the best neighborhood restaurants to the urban foodie. Using Swiggy, you can order food & beverages online from restaurants near & around you. They deliver food from your neighborhood local joints, your favorite cafes, luxurious & elite restaurants in your area. A single window for ordering from a wide range of restaurants, they have their own exclusive fleet of delivery personnel to pick up orders from restaurants and deliver it to customers. They place no minimum order restrictions! Order in as little (or as much) as you’d like. Uber Eats helps you find food deliveries around the world. Browse local restaurants and fast food favorites for inspiration. Or get just what you’re looking for by searching for a specific restaurant, dish, or cuisine. Pizza. Burritos. Burgers. Sushi. If you’re hungry for it, try Uber Eats. When you’re ready to place your order, you’ll see your delivery address, an estimated delivery time, and the total price including tax and booking fee. Faaso app comfortable runs with Android, iOS, Windows operating systems. Just grab your mobile, place your order and get fast hot food delivered. The app provides easy navigation for customers to choose the best available menu for order. It is mostly used in Mumbai, Ahmedabad, Bangalore, and Pune. The app is fairly simple to use and allows users to customize their orders in multiple ways. Pizza Hut is a global pizza delivery app service which is operating in several countries. It offers all your most loved arrangements, pasta, pizzas, beverages and sweet. Pizza Hut application offers quickly to get to and neighborhood bargains. In India, Pizza hut operating in several cities for providing on time food deliver to users.